A California native, Mark Lozano grew up in Orange County. As a young boy, he learned to swim when his dad would toss quarters into the deep end of the pool, and tell him that he could keep them if he got them. Immediately, breath-holding became a part of his in-water activities. He began surfing and bodyboarding at age 11, and began competing for Aliso Niguel High School and later for Saddleback College. At age 14, he earned his open water scuba certification from one of his science teachers, Capt. Ken Wright of Sun, Sea Adventures. It was through Wright — along with his divemaster, colleague and marine biology teacher, Phil Stirtz — that Lozano learned to truly appreciate the ocean and everything it has to offer. They inspired Mark to hunt and gather conservatively. Later, Lozano went on to earn his divemaster certification — from his now good friend Jilbert Hovagimyan. 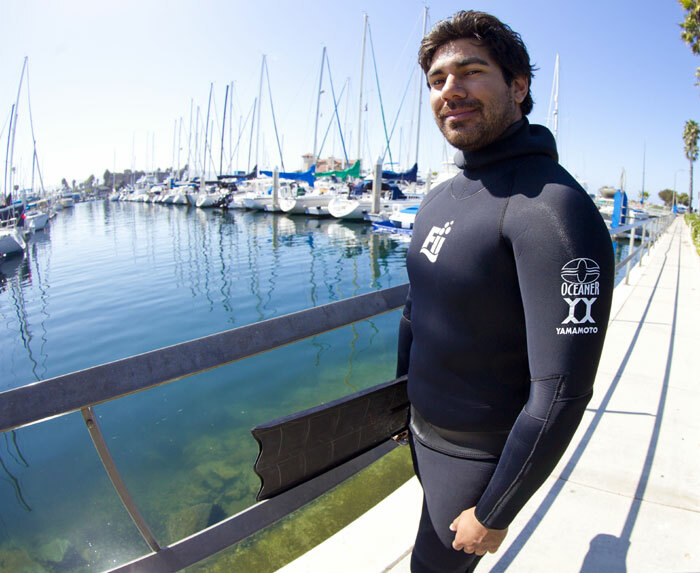 Hovagimyan saw the potential Lozano had as an instructor and encouraged him to move forward with his scuba education. After achieving PADI open water scuba instructor certification, Lozano certified approximately 10 people to scuba dive, at which point he realized his greater need for adventure. That led him to Ketchikan, Alaska, where he led snorkeling tours for Snorkel Alaska. While there, he had many rare opportunities to Freedive with Orcas and humpbacks. He even spearfished king salmon, only to have to return to shore through a river mouth and dodge black bears who were also fishing for salmon. In Summer 2005, Lozano saw a need for freediving education in California. He made contact with certifying agency Freediving Instructors International (FII), which was founded by 13-time world record holding freediver Martin Stepanek. Lozano relocated to Ft. Lauderdale, Fla., where he trained with Stepanek for six months. In Fall 2009, Lozano became FII Instructor Number 6. He was the first and only fully accredited freediving instructor on the West Coast. Today, FII has more than 60 instructors throughout the world, from Taiwan to Dubai and the Czech Republic to Colombia. Lozano is one of only five handpicked members of FII to earn the status of FII Instructor Trainer. In 2011, FII announced the release of a new course, developed over a 10-year period. The Waterman Survival and Waterman Survival extended courses are geared to anyone involved in sports or activities in roughwater situations. That includes big wave surfers, lifeguards and whitewater kayakers, among others. The Waterman Survival course is a half-day class that consists of a classroom session and a pool session. The extended course offers three days of instruction, focusing on freediving and survival exercises, both in a pool and in an open water environment. The focus of the course is to give students the tools to train for very uncomfortable situations where they could be held underwater against their will. The Waterman Survival extended course was an immediate success, with professional and world-record big wave rider Garrett McNamara, and professional surfer and Pipeline Masters winner Jamie O’Brien being among the first to enroll in the training. Since then, both McNamara and O’Brien have gone on to set possible new world records (still being verified by Guinness World Records, at press time), with McNamara’s 100-foot wave and O’Brien’s largest paddle in wave, about 25 feet on the Hawaiian scale or 50-plus feet on the face. Big wave surfers are not the only ones who endorse the courses. The elite soldiers of U.S. SEAL Team 1 have gone through the half-day class. In 2005, Lozano also began teaching snowboarding at Mountain High Resort, in the San Gabriel Mountains. He is currently nationally certified by the American Association of Snowboard Instructors as a Level 2 instructor, and he is also certified as a Level 2 adaptive snowboard instructor, to coach disabled athletes. Lozano said he looks forward each year to heading to Snowmass, Colo., where he volunteers to coach disabled veterans at the Disabled American Veterans (DAV) Winter Sports Clinic. With Lozano’s hard work and excellent work ethic, he has risen to a world-class level and is sought after by many throughout the world. He regularly offers courses in San Diego, Hermosa Beach and the North Shore of Oahu. Lozano will be in the dive pool at the Fred Hall Show giving breath-hold instructions. Put on a dry suit, jump in the pool and give it a try. He can also be reached via email at mark@freedivinginstructors.com.